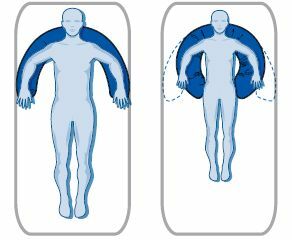 While pressure relief mattresses and cushions can provide high levels of pressure relief, some users with low muscular control may require the use of positioning aids for comfort and relief. 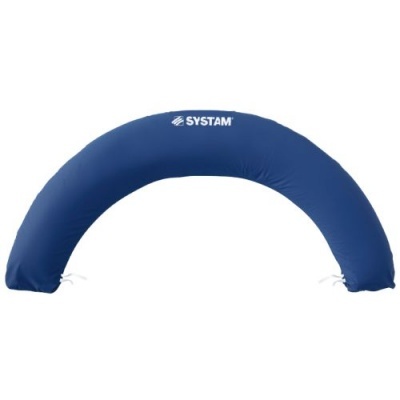 The Systam Half-Moon Micro Bead Postural Cushion holds the pelvis and upper body firmly in place when the patient is in semi-Fowler or dorsal position, helping to relieve pressure on the elbows. Helping to significantly reduce friction and shear forces, this cushion can help to rectify the postural issues that are often the root cause of pressure sore development. This cushion has been designed with the EasyShape Adjustment System, allowing it to be easily adjusted to better suit each patient's specific morphology. The straps attached to the cushion cover make it simple for precise positioning, as by pulling on the straps the curvature of the cushion can be increased.. To ensure it stays in the correct position after adjustment, the straps can be tied, providing a secure and reliable shape. This cushion is filled with ultra-light polystyrene micro-beads, providing versatile and simple adjustment. The small granulometry of the beads enhances patient comfort, while providing an almost endless array of positions to ensure the user's morphology is fully conformed to. To ensure compliance to all safety regulations, these beads have achieved an M1 rating for improved fire resistance. This item may take up to 3 - 4 weeks for delivery, depending on stock and availability. For more information about the delivery time of this product, please call our Customer Service Team at 020 7501 0592.